DIY gourd birdhouses are a neat craft for the entire family! You can design and paint them an array of colors to fit your garden decor! One of our favorite craft projects to make and create are DIY gourd birdhouses. Gourds are easy to grow here in Arizona, too! 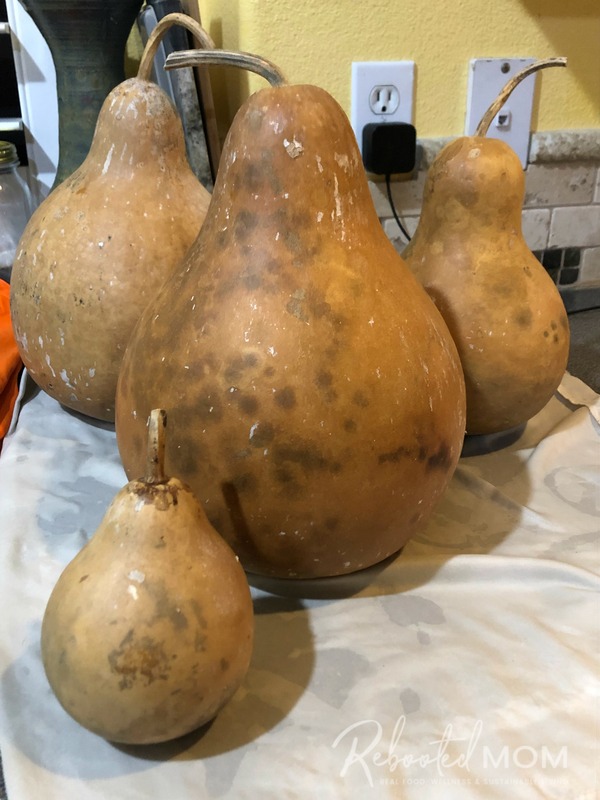 But if you aren’t up for growing your own gourds, you can look for a Gourd Farm — many of them have gourds perfect for birdhouse crafts. 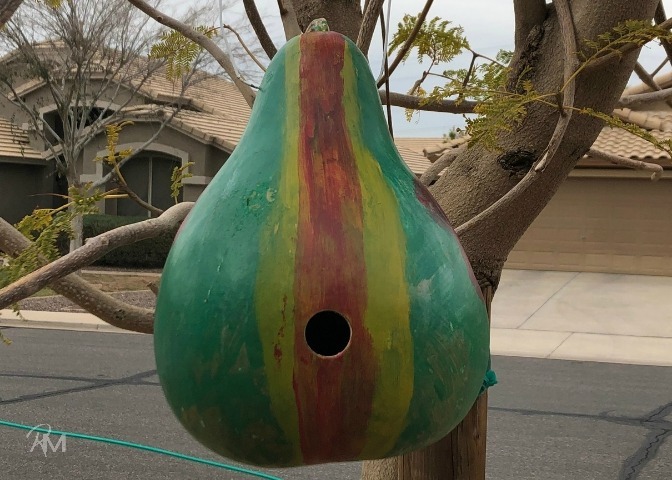 The best part about creating gourd birdhouses is that each one is unique! Gourds are left on the vine after the stem and surrounding leaves begin to turn brown. At that time, you can take it off the vine, and give it a wipe down with a damp cloth. Allow it to sit in an open area for several months to a year. 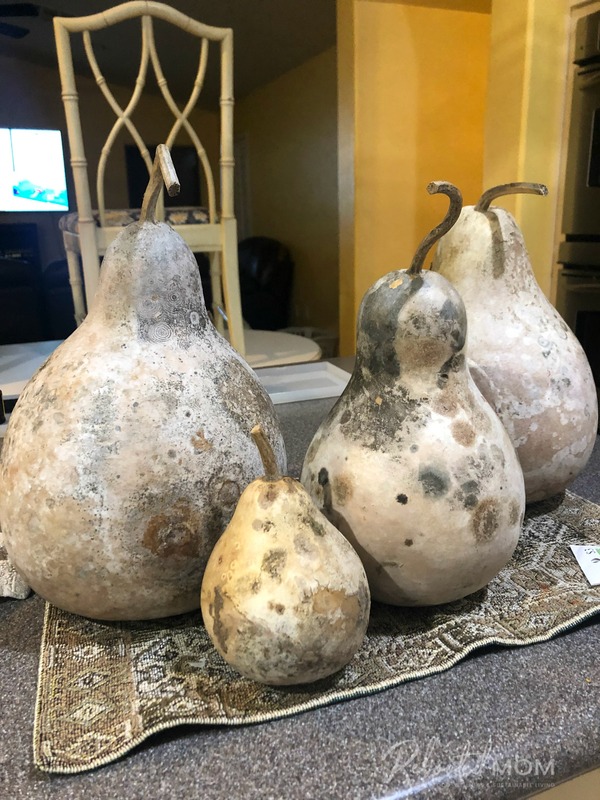 As the gourd dries during that time, it will start to appear gross on the outside. That’s ok and completely normal. If it is not soft, leave it alone — they will turn moldy and discolor, maybe even peel. That’s all part of the drying process. Once the gourd is completely dry, you can prepare the gourd by cleaning it before you begin your craft project. Use a drill to put 3-4 small drainage holes in the bottom of the gourd just in case water gets inside. This will allow the gourd the opportunity to drain evenly. 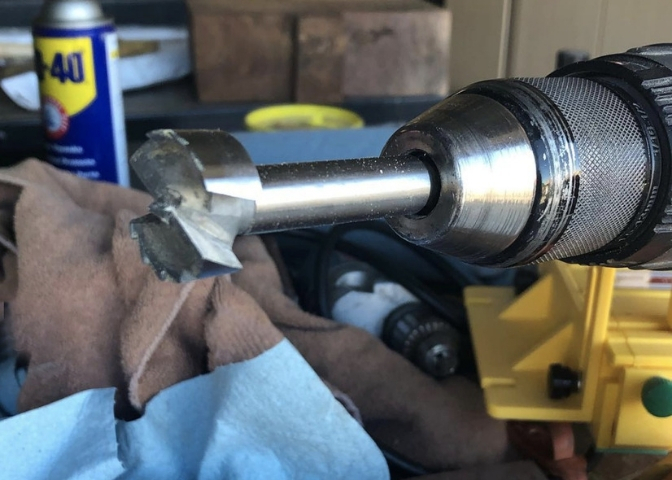 Then use a 1 – 1 1/2 inch hole saw to drill a hole for the opening of the birdhouse. We initially tried a spade bit but it wasn’t quite enough to get that hole in there without tearing up the gourd. You’ll want to research what types of birds frequent your area. In our area, cactus wrens are popular and the 1″ hole diameter is perfect for allowing them entrance into the house. Depending on your bird variety, you might want to try a larger hole (1 1/4 or 1 1/2). We also drilled 2 small holes at the top of the birdhouse – one on each side of the stem. Those holes allowed us to cut a coat hanger (where the pants would hang) and “hook” the ends in to the top so we could hang the birdhouse on our trees. Once the gourds are dry, they are ready to decorate your gourd birdhouses! You can spray paint the gourds with a solid color (white is always a good option) to create an even canvas for the kids to work on further. 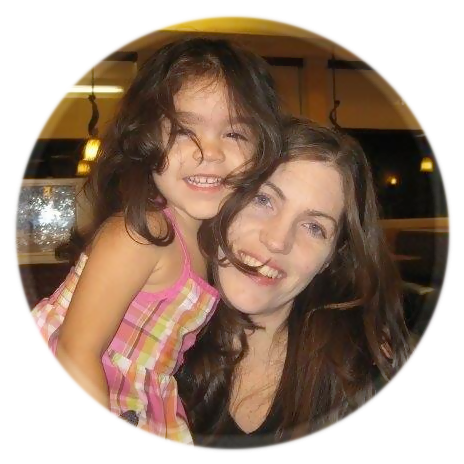 Or you can hand over the colors to the kids and let them run wild. You’ll want to aim for an outdoor enamel paint — do not use a water-based latex paint as it can peel over time. Give the gourd at least two coats of paint, allowing the gourd to dry sufficiently between coats. Once dry, spray the gourd with a clear coat or two of an outdoor protectant and allow to dry (just 10-15 minutes). Once the gourd was dry, we snipped a metal coat hanger in two pieces (where the pants would have hung), and fit each side into the holes on the top of the gourd. We then hung it in the tree. You could also use burlap rope, too. Our kids loved making these DIY gourd birdhouses and were so excited to hang them in our tree. We made a paper funnel to fill the birdhouse with seed, then spread a few cups of seed on the yard to attract the birds to the area. Now we watch the little Cactus Wren birds flutter in there every morning! Have you ever grown gourds in your garden or made your own gourd birdhouse? 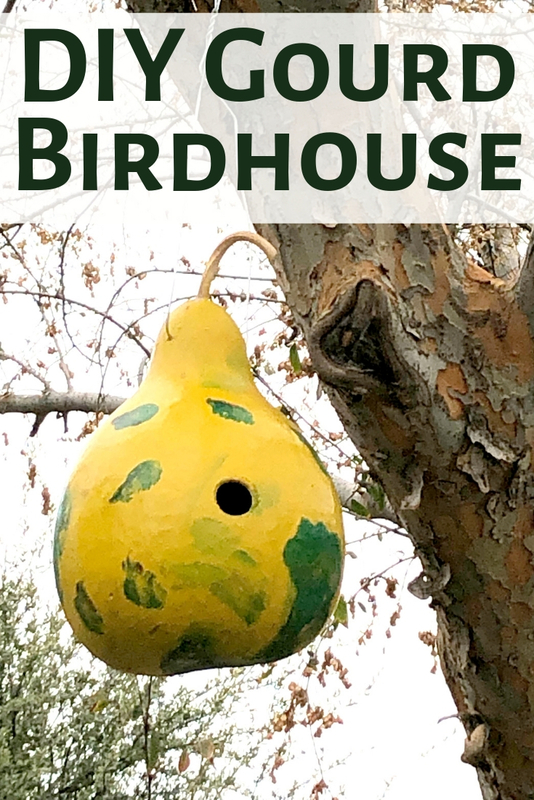 Share the post "DIY Gourd Birdhouses"